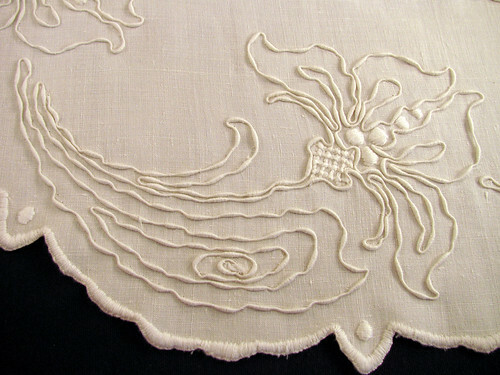 This linen table center is still in like new condition. As mentioned a few days ago, coronation cord hasn’t been manufactured since the 1920’s. 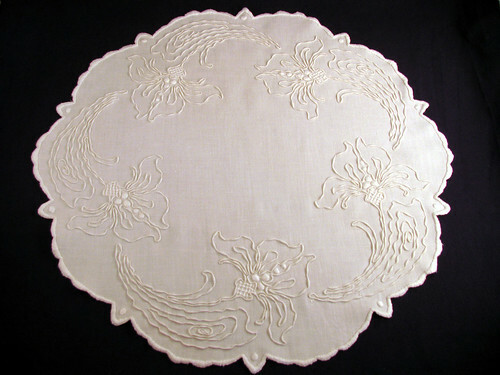 The embroidered iris motif is done by couching coronation cord in a continuous manner for each flower. Though simply done I think it is rather elegant. It is one of my favorite pieces. In this close up photo one can trace the continuous pattern from the center spiral of the big leaf around the iris petals and back down the other side. This entry was posted on Saturday, March 14th, 2009 at 3:00 am and is filed under Doily, Embroidery and Vintage. Tagged: Doily, Embroidery, Needlework, Vintage. You can feed this entry. You can leave a response, or trackback from your own site. Just love this table centre. Its absolutely beautiful. Thanks for sharing.